So my goal with your dress is total annihilation,' my best friend Abby, said as she pushed a large spiral-bound sketch pad across the table. ' In other words, you will look so pretty that Sabrina Hartley cries. Anything less than actual tears and I'll count this as a failure. I picked up the sketch pad and set my dish full of ice cream on the far corner of our table, where I hoped it would be less of a temptation. Not that I could keep away from it for too long. I mean, my family did own the ice-cream shop in town. There was only so much resisting I could do. Welcome to Alaska.A special welcome to my boyfriend, Jake, the cutest tourist I've ever met. Jake and I like to hike our great (romantic ) nature trails. . . . While you're there, find out what's up with that hot girl Jake brought to the lodge this year. She's probably just his cousin or something. Right? Get ready for a vacation you'll never forget. This book gave me a much more modern view of Alaska. 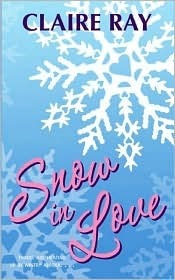 Set in a ski resort with the most amazing ice cream parlour, I was ready to grab my skis and jump on the next plane. This was a quick and easy book and was such a delight to read. It was most definitely a quirky, sugar coated romcom. It might be a wintery book, but it was full of sparkle. This book definitely made Alaskan feel a lot let harsher and a lot more habitable. For the first time, since reading books in preparation for Alaska week, I actually didn't feel cold. This is a typical love story or love triangle should I say. Girl has boy; girl then doesn't have boy: girl makes boy jealous with another boy and then realises that there is something rather lovely about the other boy. The sort of 'butterflies in your tummy' love triangle that make it difficult for you to put the book down. I honestly wish I had read this book over Christmas, because it would have been just the type of winter book I would have loved. Cheesy but adorable. Throw in the Northern Lights for the finale and you have a rather magical read. The characters are rather lovely. Everyone will be swooning over Will as he is just adorable. Definitely a contender for the fictional boyfriend role. Jessie is a good main character, but you did want to shake her a few times through the book when she continued to make stupid decisions! I wanted to wash her eyes out with Optrex at one point, just so she could see what was actually happening around her. This book talks a lot about food, which I loved. The ice cream flavours on offer alone at will have you salivating. I had this urge for a tub of Ben and Jerry's every time I picked up the book. I would love to own an ice cream parlour just like The Snow Cone! A lovely comfort read, ideal for the winter break. Think Pretty In Pink meets Made of Honour! Thank you. I really enjoyed it. Problems with commenting today so replying to your reply instead. *passes Ben and Jerry's icecream.